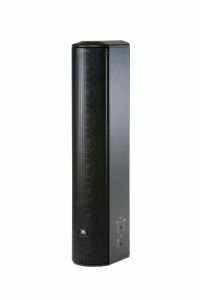 The What: At the ISE show in Amsterdam, JBL Professional released its new CBT 50LA-LS line array column loudspeaker that comes with full EN54-24 certification. EN54-24 is the EU standard for loudspeakers intended for use in voice announce and fire alarm systems. The CBT 50LA-LS is an addition to the popular CBT Series (Constant Beamwidth Technology(tm)) that has been developed exclusively for the European installation market. transformers, so it can be used on 70V/100V distributed speaker lines or as low impedance speakers. venues and consistent frequency response at every listener location.The What Else: In addition, the CBT speakers provide Dynamic SonicGuard overload protection circuitry, which reduces distortion at high drive levels, along with user variable voicing which allows for selecting a flat frequency response or a midrange presence peak for clear speech intelligibility.